Quail Eggs. Too delightful…too delicate not to like. I’ve been a giddy bird watcher for years. Actually I started watching birds in perhaps an unlikely place. Not the mountains, or the shoreline, or at lakes or in woodlands, but in NYC. You’d be surprised. Central Park–that huge piece of greenery in the middle of uptown separating the West from the East (or the East from the West deepening on which side of town you live)–held an oasis of a party during migrating seasons. In spring and fall an Audubon-like atrium popped up in Central park and us bird watchers were enthralled. At the boathouse (where you can rent a row boat and paddle on the park’s friendly duck-filled lake) a large, thick book was stored. Birdwatchers would note what they’d seen that day in the park. When you first arrived you’d check the book to see what you might want to look for and where (the rambles, the reservoir, near the carousel). Best part was when you had a new species to add to the list. I never saw quail there. They have other habitats to haunt. But I do see quail eggs often at the K & S markets in Nashville. And I do harvest them from the refrigerated counter to carry home. In addition to bird guides that tell you the size, feathers, call, mating habits, nest-shapes of every bird species, are also bird-egg guides. So if you come upon a nest with blue speckled eggs you’ll know Robins are percolating there. 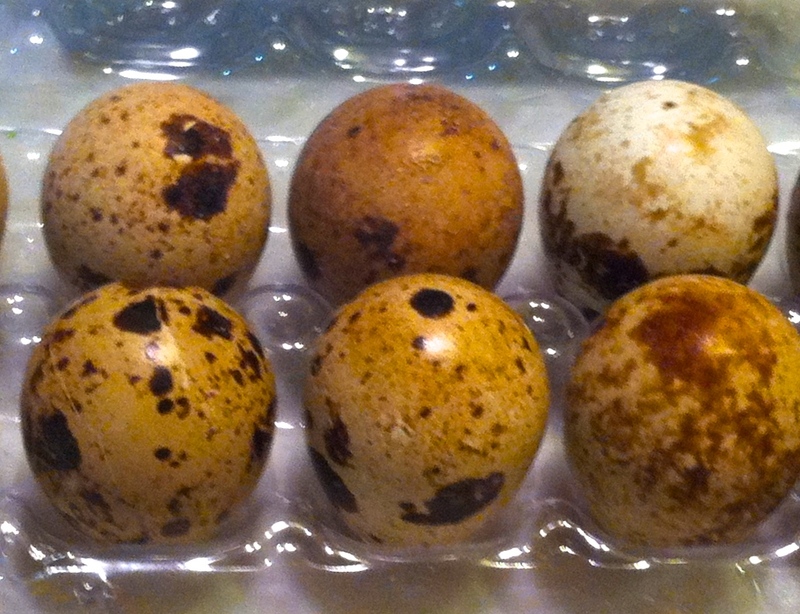 Quail eggs would make the “Top Ten Beautiful Bird Eggs” list. Ecru, sepia, tan eggs with spots of black and brown and amoeba-like designs. Inside the hard shell is a tiny replica of the hen’s egg. My favorite way to cook them is sunny-side up. You get a tiny sunny-side up egg that tastes delicate and light. A little salt. And that’s it. I think of them as garnish. 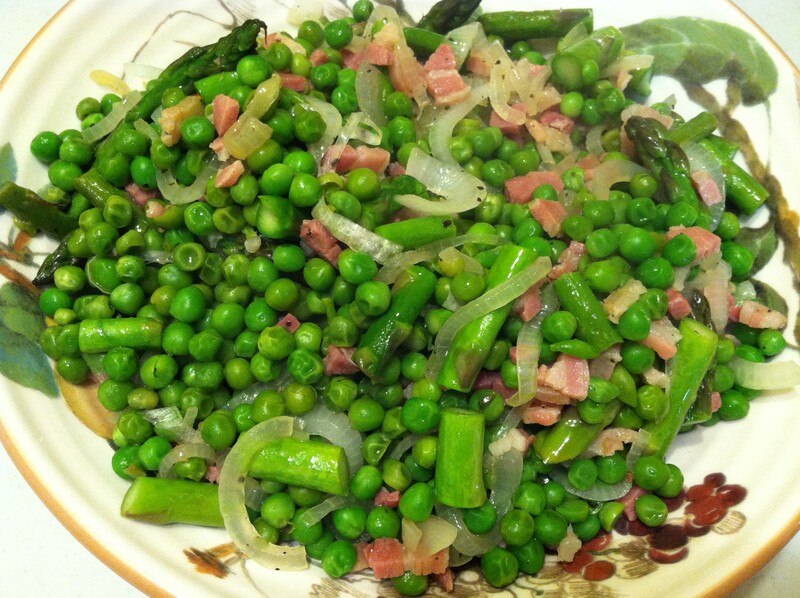 My favorite place to place the garnish is on asparagus. First: Heat the oven to 400 degrees F. Line a sheet pan with foil. Lightly oil foil. 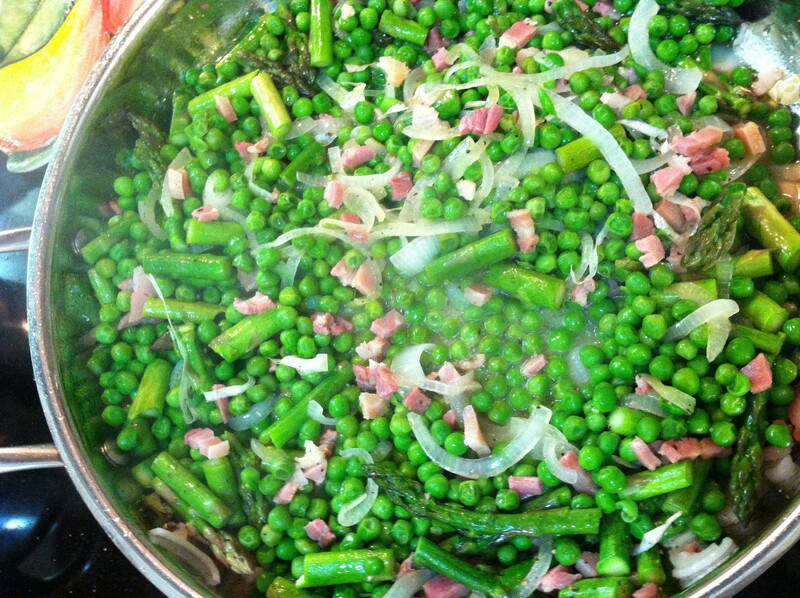 Cut off woody ends of asparagus. Rinse under cool water. Lay them out on the sheet pan. Drizzle some olive oil. Season with salt & pepper. Roast until crisp-tender or your desired doneness. Just before serving sprinkle some grated parmigiano on top. Meanwhile, get out a medium mixing bowl. If it has a lip for pouring all the better. But if not, no prob. Gently break each quail egg and gently drop the egg into the bowl. The pack I get at K & S has 10 eggs. Use them all. Now, I say “gently break” but it’s a combination of gently and earnestly. Quail egg shells tend to be harder than hen egg shells. Sometimes I even use a serrated knife to get the cut going then break the shell. Heat a little olive oil in a large sauté pan. Then gently pour each egg yolk into the pan (it will naturally be accompanied by some egg white). 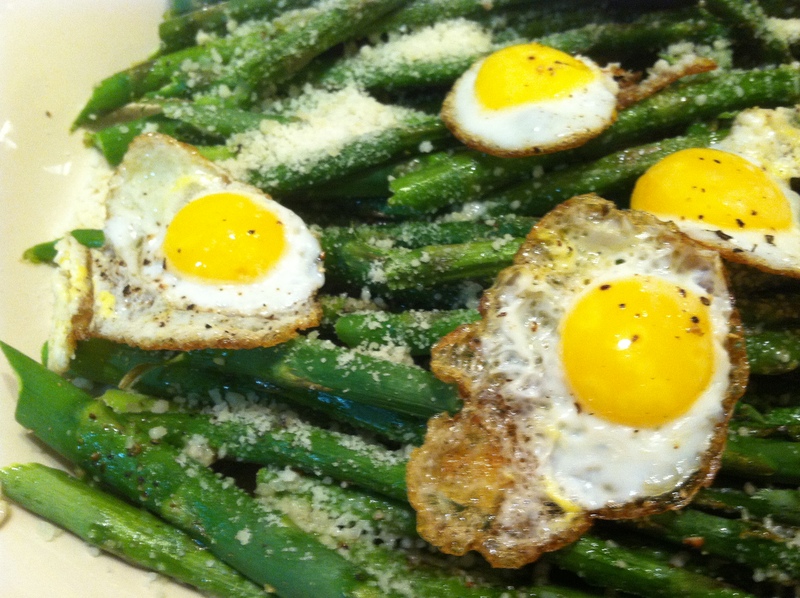 You’ll see the little perfect sunny-side up eggs form quickly. 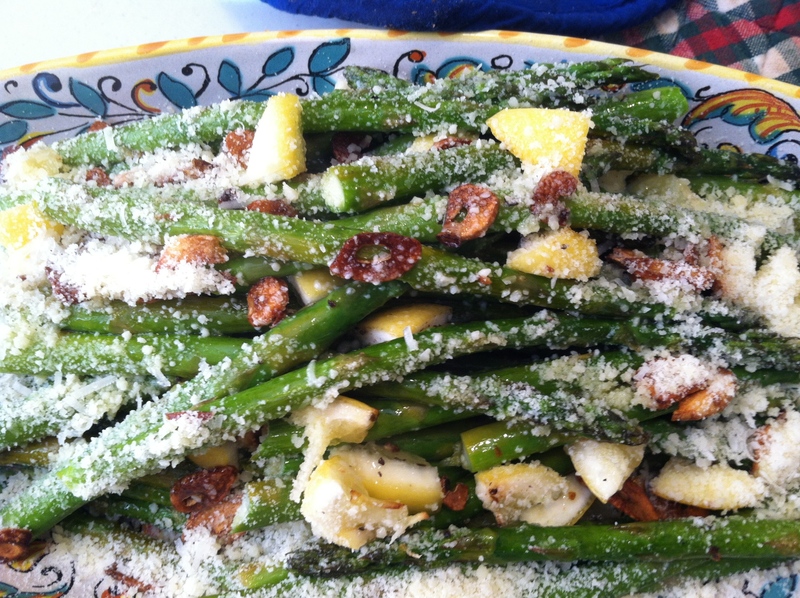 Sprinkle with salt and spatula them out to top the asparagus. Hmmm-mmm!